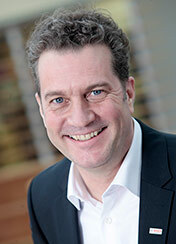 Henk Becker was appointed the Chairman of the Board of Management of Robert Bosch Power Tools GmbH in 2019. He is responsible for Engineering, Manufacturing, Digitization, Quality, Business Development, IT, Communication, Home & Garden, Measuring Tools and Rotary Tools. He joined the Bosch Group in 1995. Before assuming his current position, he was Vice President Engineering for Power Electronics in Reutlingen, from 2008 to 2013, and since 2013 he has been a member of the Executive Management of Bosch Power Tools GmbH. Responsible for Engineering, Manufacturing, Digitization, Quality, Business Development, IT, Communication, Home & Garden, Measuring Tools and Rotary Tools.